Time: 5.45 p.m. to 8 p.m. Presentation by: Mr. Bipin Shah Chairman and CEO, Kovair Software, Inc.
Seats are limited. To facilitate logistics such as dinner etc., please pre-register at https://goo.gl/7D5YQb. Confirmation of registration will be mailed by 10th Nov 2015 or earlier. You are encouraged to participate in a quiz at ://goo.gl/lm0MGV and win FOUR prizes sponsored by Orbit Innovations. Two prizes are reserved for the lucky winners who attend the presentation on 13th Nov, 2015. Please note that the quiz will be open till 11th Nov 2015 midnight. Tea & Fellowship: 5.45 p.m.
Kovair Integrated ALM provides you a centralized web based integrated platform that helps you in having an end-to-end visibility on the entire application or product development. The stakeholders while remaining in their existing external tools can still collaborate in a real-time manner. This helps organizations to make the development process faster with better quality. 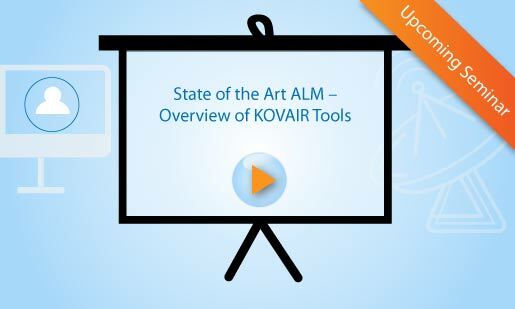 This presentation will give an overview of these tools that are offered by KOVAIR. Mr. Bipin Shah is the CEO and Chairman of Kovair for the past several years based in the Silicon Valley area of California. Prior to that he spent more than 25 years in the semiconductor industry with Fairchild Semiconductor and Altera Corporation where he was Vice President of Operations and President of Altera Japan. He was involved in startup Venture Capital investments for about 10 years and has served on the boards of several startup companies. Bipin holds a Bachelor’s degree in Electrical Engineering from Jadavpur University Kolkata and a Master’s degree in Electrical Engineering from the University of Wisconsin, Madison. He is also involved in several non-profit and educational institutions being associated in an advisory capacity with California Polytechnic University, Pomona, and many Indian educational foundations.